Should I Pre-Filter the Water? We always recommend locating the misting pump adjacent to other equipment such as AC Units, pool equipment, or in utility rooms to mask the small ambient noise level that emits from the misting pump. 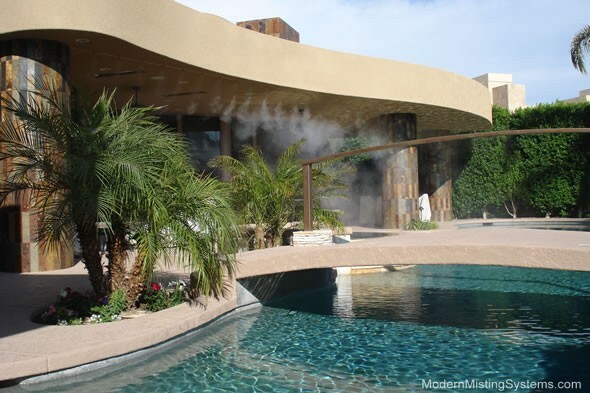 We recommend tying the misting system controls to the pool equipment when practicable. We use on-site steel tube bending machines to mold the shape of the delivery lines to the contours of the façade of your home. When necessary, we trench the ground to hide any lines that lead from the pump to the mist delivery area. Modern Misting Systems regularly use custom paint and powder coating techniques to make our stainless steel delivery systems match your home color. It is the best way to make them disappear. If your home is under construction or is being remodeled, we have the ultimate application to integrate the system into your construction completely. It is a custom extruded channel that can be architecturally integrated into the new construction or remodel. See our Residential photo gallery for more great photos! LOOKING FOR A RETRACTABLE AWNING?